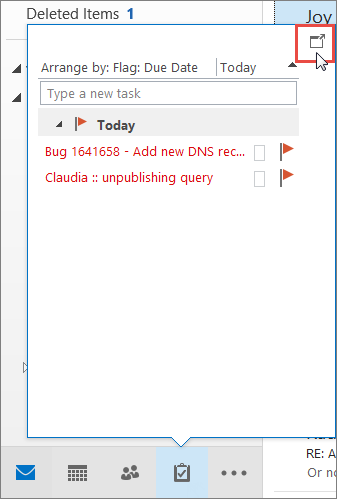 When you point to the Tasks icon on the navigation bar, the Tasks peek shows your upcoming tasks and flagged to-do items. 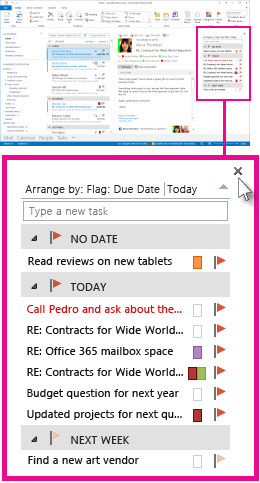 To keep both in view, pin the Tasks peek to the Outlook window. To close the peek, at the top of the pinned Tasks peek, click . When a peek is pinned or unpinned it only affects that view. For example, if you’re in Mail and pin the Tasks peek, when you switch to Calendar, the Tasks peek doesn’t appear. You can pin or unpin the Tasks peek in each view by clicking or .